Center Flees are accelerometer based, networked LED devices, spun like fire poi, they make music and light effects. They respond to subtle changes in velocity, making a delicate conversation between performer and technology. The Arduino powered smart poi use the accelerometer data in multiple ways. The spinning motion is translated into RGB LED values, printing colors at specific points in the rotational arc. Accelerometer data is also transmitted to a computer using XBee Wireless chips, producing sounds with each spin. To change between color sequences, ranging from rainbow to red, blue and green channels, simply drop smart poi while at rest or stall while spinning. The effect is truly mesmerizing, as witnessed at Maker Faire Bay Area 2013. A visceral combination of motion and light, they are simple to use but difficult to perfect. Cassandra started fire spinning on the Brooklyn Waterfront in 2002. She started spinning staff and then poi a few months later. She quickly became on of the best poi spinners in New York performing at clubs such as Webster Hall and events such as Art For Life in Montack. A natural teacher, she taught a poi spinning workshop for three years after being granted funds from the Black Rock Arts Foundation. 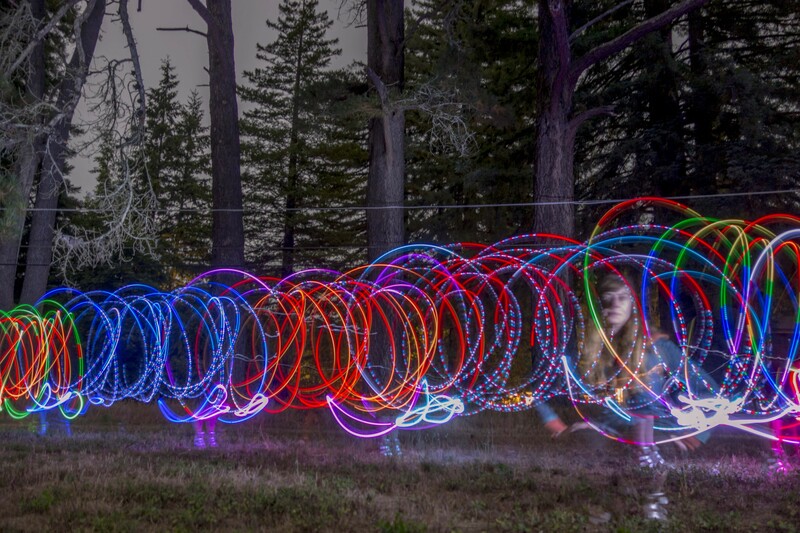 At the same time she was learning to spin fire she began experimenting with el wire props and various non-fire toys. Center Flee was initially a computer interface to control music or video. She wanted to use the motion of fire spinning as a computer controller. Two accelerometers and a micro controller sent midi to a computer and were used to play music, video or draw lines on screen. The first version of Center Flee was showcased at the Festival of the Falling in 2003 and Dumbo Arts Festival in 2003. In the fall of 2003 she started at ITP and didn’t work on them again until Maker Faire 2012. Then she dusted off a few old projects as potential Maker Faire entries and was delighted they still worked, but unimpressed with the clunky wires to the computer. She became determined to refine the design and update the project, make them wireless and add LEDs. In 2013 she completed Center Flee 2, two Arduinos with accelerometers, LEDs and XBees, each of the two poi feeding information into the computer wirelessly. What started out as an LED debug, became the most fun and rewarding aspect of the project. The RGB LEDs and the accelerometer made some pretty interesting patterns. Something she anticipated in the first version of Center Flee, but wasn’t able to visualize until ten years later. She has since added both a hat and dress, also networked, to increase the impact of the poi. Cassandra Marshall works as a UX Designer and Web Developer specializing in non-profits. A graduate of NYU’s Interactive Telecommunications Program [ITP] and UCSC’s Film and Video Program, she has worked with digital media for ten years, web tools for 8. Her clients include publishers, philanthropists, artists, fashion designers, writers and her parents. Not only is she well versed in digital media, she is active in art communities with titles such as a modern dancer, artist, crew member for large scale art installations, art fabricator and social media rockstar. Currently she is perfecting her newest creation Center Flee, an interactive performance device, debuted at Maker Faire 2013.